Davis’ one-of-a-kind pendants are made from layers of natural resin that she hand-paints with toothpicks (above) or embeds with natural objects such as a Japanese maple leaf (right) that she’s collected. “I found that maple leaf one day on the sidewalk,” she says. “It’s that beautiful red they get in autumn.” After she completes a pendant, she smoothes it to a matte finish. 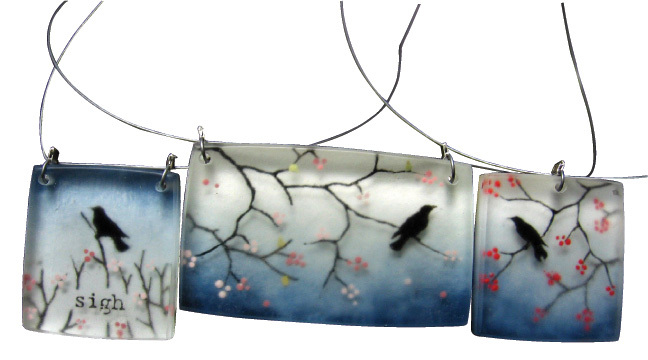 Whether she’s making jewelry, painting or sculpting, resin is her favorite material. “I love resin,” she says. “It’s an affordable medium, and you can dye it and cut it into shapes.” Her pendants cost $60 to $150; each one-inch pendant hangs on a nylon-coated cable with a silver lobster claw clasp. Contact jewelry maker Faryn Davis via her website at fernworks.org. Her jewelry is available at Redux (811 E. Burnside, 503-231-7336) and Relish (433 N.W. 10th Ave., 503-227-3779) in Portland.